The fundatrices of Colopha compressa induce laterally compressed cockscomb-shaped galls along the midrib on the upper surface of elm leaves (see first picture below). These galls are yellowish, often tinged with red. Fundatrices (not shown) are yellow or yellowish green and are lightly covered with waxy powder. Their antennae are about 0.12 times as long as the body. The body is oval or elongate, with wax plates on each of the thoracic and abdominal segments, and small siphuncular pores - which may be present or absent. 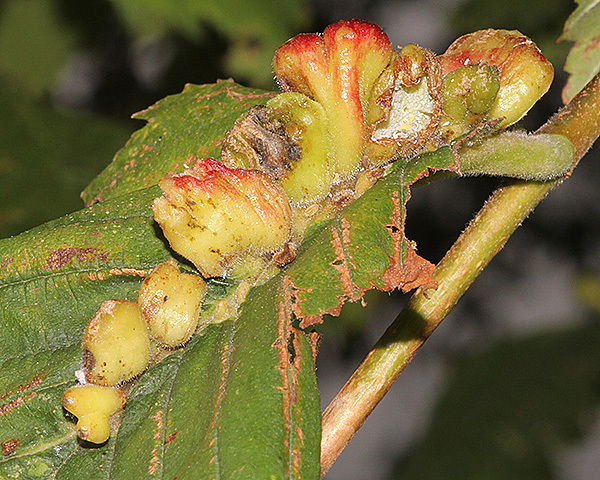 The yellowish offspring of the fundatrices (see second picture below) develop to green alatae which leave the gall. 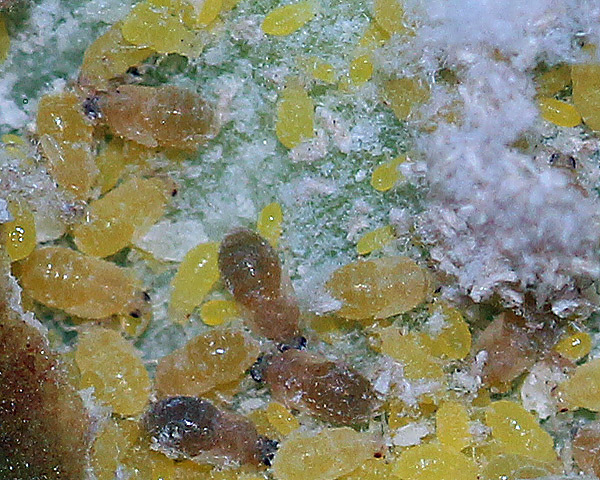 These produce dark yellow apterae on the secondary host which have a body length of 0.9-1.5 mm, and secrete flocculent wax. Both images copyright Maria Fremlin, all rights reserved. Alatae emerge from their galls on elm (Ulmus) in July, from an opening on the underside of the leaf, and colonise the roots of sedges (Carex) and cottongrass (Eriophorum). Alate sexuparae return to elm in September-October, although some populations may persist on the roots of sedges throughout the winter months. Colopha compressa is found throughout Europe, east to Turkey, Ukraine and Kazakhstan, and has been introduced to Siberia. Blackman & Eastop list 22 species of aphid as feeding on English elm (Ulmus procera) worldwide, and provide formal identification keys. Of those aphid species, Baker (2015) lists 14 as occurring in Britain: Colopha compressa, Eriosoma anncharlotteae, Eriosoma flavum, Eriosoma grossulariae, Eriosoma lanuginosum, Eriosoma patchiae, Eriosoma pyricola, Eriosoma ulmi, Kaltenbachiella pallida, Macrosiphum euphorbiae, Mimeuria ulmiphila, Tetraneura ulmi, Tinocallis platani and Tinocallis nevskyi. We especially thank Maria Fremlin for the images above.